Request Appointment Veterinary dermatology care focuses on the diagnosis, treatment and management of all skin diseases, allergies, autoimmune skin diseases, food reactions and atopic dermatitis on pets. Understanding what causes your pet to become allergic and controlling flare-ups early and quickly is the best healthcare practice recommended by veterinary dermatologists. Maintaining a regular skincare routine on pets helps to prevent skin allergies and skin problems before they start. 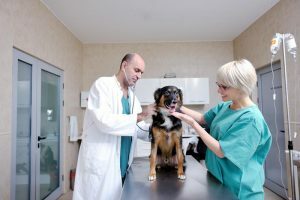 Scheduling a quick visit with a veterinarian experienced in dermatology to conduct a professional skin exam is critical for prevention and for not letting a dermatologic problem get out of hand. Spotting the signs of a flare up early is critical to minimize potential pain and discomfort on cats and dogs, especially in kittens and puppies. At Home Animal Hospital understands the tropical climate of Maui and the effects on your pet’s skin. Our veterinary hospital in Kahului is fully aware that even though cats, dogs, puppies and kittens have similarities, every pet is unique. Therefore, our veterinary hospital researched and created specialized dermatological medical services optimized for Maui’s unique conditions. When it comes to veterinary dermatology our animal hospital has developed a specific program for managing your pet’s symptoms by performing sophisticated allergy blood tests for Maui’s seasonal allergic flare-ups. Our team of veterinarians experienced in dermatology can develop a customized monthly preventative flea and tick program specifically for your cat or dog. We carry an extensive range of the best pet preventative products for fleas and ticks, as well as new medications that have proven to control symptoms of environmental allergies in dogs. In order to complement our dermatology treatments we have partnered with Science Diet, Royal Canine, and Purina to provide prescription only diets for pets on Maui. Improving the quality of life for you and your pets is our primary mission and finding the way that works best for both of you is our most important job. Give us a call at (808)-873-0102 to talk to one of our experienced vet specialists, or request an appointment online for a medical evaluation or treatment.